The new owner of this Southampton estate contacted us to enhance the expansive property. The objectives were clear, but challenging: transform the property into a ‘summer retreat’ to accommodate entertaining a large number of guests, while providing safety and excitement for the owner’s family — and that the property reflect the Hamptons classic themes and incorporate their modern flair while the entire home was being remodeled; which meant coordinating all aspects with multiple tradesman. The immense size of the property was managed by creating distinct views and separate outdoor “rooms” while maintaining an open feel. Symmetry played an important role in the overall design concept in order to marry the house to the landscape. 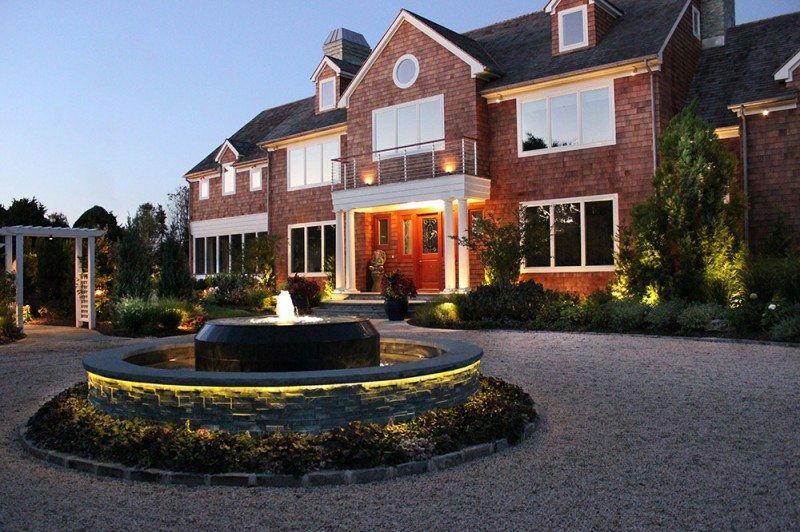 The circular driveway and approach to the front of the home were in need of a Grand Entrance. In the central island of the driveway, a two-tiered gunite fountain displays two completely different water effects. The fountain is low-profile so as not to convey an ostentatious look the homeowner wanted to avoid. The fountain is a perfect 16′ diameter across and repeats materials seen throughout the property. The brass ‘bubbler’ fitting provides a turbulent water effect while simultaneously filling the top basin. This allows the water to gently spill over the honed slate tile in the spirit of an Infinity Edge pool. Water then enters the receiving basin and is re-circulated through a series of pumps located over 120’ away. LED strip lighting was installed below the bluestone reveal which washes over the outer intricate stone work. Submersible lighting was installed in both basins and up lights the interior pools allowing the fountain to maintain a subtle glow at night. All fountains required 3’ depth frost footings and steel reinforcement throughout the entire structure to meet NYS Code, as well as ‘wet sleeves’ for all electrical requirements. A hidden, formal Sculpture Garden was created to enter the backyard. Original works of art were carefully chosen to punctuate the meandering irregular bluestone pathways and interconnecting pondless waterfalls, as they lead through custom cedar pergolas and foot bridges, complimented by the uniquely-styled gas fire pit. Large evergreens were chosen to obstruct certain views, while colorful plantings provide glimpses of what’s hidden around the next corner. The house extends into this charming landscape via the nanawall with delightful 360 degree views of the property and indoor fireplace created with the East West Stone utilized elsewhere. It was extremely important to capture the scope, scale, and depth of the property through the initial view out of the rear French doors. That vision was accomplished by creating layered backdrops culminating in a cedar gazebo behind the renovated tennis court. The perspective then travels forward through a formal Boxwood garden; highlighted by a custom radial arbor nestled in a lush display of colorful Carpet Rose plantings. A stepping stone path leads to the tumbled travertine patio that surrounds the gunite pool. The pool was completely renovated with new plumbing, steps, marble dust, slate tile, and an LED color pool light. Low-voltage and line-voltage lighting was installed throughout the property to visually connect areas of interest, highlight foliage, and to illuminate high traffic and entertainment areas. The existing pool’s close proximity to the deck posed a concern for the safety of the owner’s young grandchildren. Adding railings along the entire deck would have obstructed the panoramic views. To circumvent this issue, we designed decorative planter boxes veneered with East West Stone and capped with rock-faced bluestone set 18” above the height of the deck. These serve as railings and meet NYS Code, as Croton and Coleus provide a splash of color in the foreground. The IPE deck and 16′ x 32′ cedar pergola offer a relaxing refuge from the sun. The outdoor kitchen was positioned perpendicular to the house keeping interior views unobstructed, and fully equipped with all stainless steel fixtures. An avid sports fan, the owner did not want to sit indoors watching his favorite teams away from his family and friends, so we brought the “sports bar” concept outdoors by creating an all-inclusive entertainment space. An impressive 12’ outdoor fireplace, as well as a sleek radial bar set the stage for this experience. The outdoor TV is mounted to the mantle of the fireplace, equipped with an infrared cable system incorporated into the home’s Crestron system. Guests enjoy optimal viewing from the comfortable Frontgate furniture. Low-voltage landscape lighting extends the experience into the evening hours with the vertical assistance of our custom radial pergola that mimics the curvature of the bar. This outdoor room is an extension of the home and the perfect entertainment spot. Flowing water was a major element that the owner wanted to introduce throughout the property. We designed a symmetrical water feature around the pool that mirrors the footprint of the fireplace, balances the property, and compliments its grand scale. This custom gunite fountain was designed to serve as a conversation piece for guests enjoying the property. We wanted to create a dynamic feature that would display two different cascading effects. A “waterwall” allows the water to cascade down the ledges of the stone wall from a hidden basin into the gunite trough. Two sheer descent piers frame the “waterwall” and mimic the wood bins of the fireplace. The piers are styled in the same slate tile installed in the renovated swimming pool. Submersible lighting was installed inside the basin to uplight the water features and capture the dramatic shadows of the rippling water at night. A variety of complimentary plantings were used to soften the hardscape, as well as provide successive blooms throughout the season. Buddleia, Buxus, Ilex, Juniperus, Spiraea, Carpet Rose, Geranium, and ornamental grasses were used to discourage deer consumption and provide the color and texture that gives this landscape its seasonal appeal. While maintaining a delicate balance of classic and modern influences — and by introducing functional and decorative spaces — we not only achieved, but surpassed the goals of our client. The property is now a showcase for all to enjoy!